Pick Analysis: Alabama may have overlooked Cunningham in the recruiting process due to his lean frame (he had 194 tackles, 41 for loss, 12 sacks as the state's 5A Lineman of the Year in 2012), but NFL scouts won't. He started the final five games of the year for the Commodores as a redshirt freshman (67 tackles, 6.5 TFL, 1.5), and then starting the final nine in 2015, eventually leading the team in tackles for loss (16.5) and forced fumbles (four) in a first-team All-SEC effort. Cunningham led Vandy with 125 tackles in another first-team all-conference season, with 16.5 tackles for loss. He also garnered first-team Associated Press All-American honors as a junior, proving his explosion on the national college football scene. 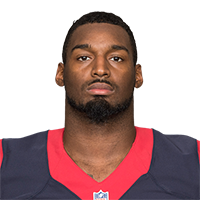 Published: April 28, 2017 at 09:23 p.m.
Andre Johnson announces the Houston Texans' selection of Vanderbilt linebacker Zach Cunningham in Round 2 with the No. 57 overall pick in the 2017 NFL Draft. NFL Media?s Bucky Brooks, Matt Money, and Lance Zierlein give Zach Cunningham a B draft grade. Published: April 12, 2017 at 08:29 p.m.
Everything you need to know about Vanderbilt linebacker Zach Cunningham. Published: March 31, 2017 at 04:46 p.m.
Vanderbilt linebacker Zach Cunningham goes through drills at the 2017 NFL Scouting Combine.